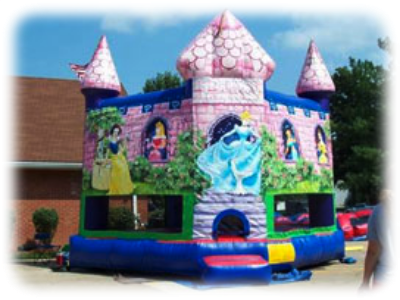 Bounce House Combo's — Carnival Times, Inc. Needing a cotton candy machine or bouncer for your next birthday party? Carnvial Times offer up to 6 hour rentals, and can provide overnight services too. Inflatables such as obstacle courses, giant slides, and even jousting arena's are available for any type of event. Monster Truck designed combo unit with bounce, climb, slide, & basketball hoop! Having a big party, but don't want to spend a lot for kids of all ages? Event adults? Check into the 32' obstacle Jump N Run! Requires 1 ~ 20 amp independent circuit. A slide on each side for double the fun. Great for all ages, including teens! 25x20x18 area required with 2 ~ 20 am dedicated electrical circuits. $295.00 .........Up to 6 hrs. Wow! This item is great, has a very large bouncing area and slide attached. Kids will play all day!.. 20x20x16 area required with a dedicated 20 amp circuit located within 80' of the electrical source. $245.00 .........Up to 6 hrs. What a great way for kids to have fun! Perfect for outdoor backyard parties. 29x15x15 area required with a dedicated 20 amp circuit located within 80' of the electrical source. $235.00 .........Up to 6 hrs. This is great for those youngsters. Multi-play area with slide and pop-ups! Only ..8 1/2' tall so it can fit inside a garage or basement. 13x11x8 area required with a dedicated 20 amp circuit located within 80' of the electrical source. $175.00 .........Up to 6 hrs.